A couple of months ago, I was fortunate enough to receive some cans from Fallen brewery in Scotland. The Stirlingshire-based brewery have recently invested in a state-of-the-art ABE canning line capable of filling up to 900 cans an hour, and kindly offered to send me some samples to try. I finally got the opportunity to sit down and try the four beers over the course of two evenings last week, and decided to jot down some thoughts. I really like Fallen’s branding, and these new cans are no exception. There’s a wonderful minimalist feel to the designs, complemented by the labels that, despite being stuck on, don’t feel at all cheap. First up was New World Odyssey, the brewery’s 4.1 per cent blonde ale, made with new world hops (Saaz, Citra and Mosaic). Out of the can, the beer pours a straw-yellow in colour, with a very light and thin white head. The aroma is predominantly of citrus, although it isn’t particularly pungent. The beer drinks much like a dry hopped lager would - incredibly light and pithy and clean, with a touch of spice. This is unsurprising considering the malt bill is made up almost entirely of Pils malts, with a touch of Vienna thrown in for good measure. I’ve been drinking a lot of lager recently, and this crisp blonde brew was excellent at the end of a warm spring day. Progressing upwards in ABV, next was the turn of Dragonfly, a 4.6 per cent American amber ale. 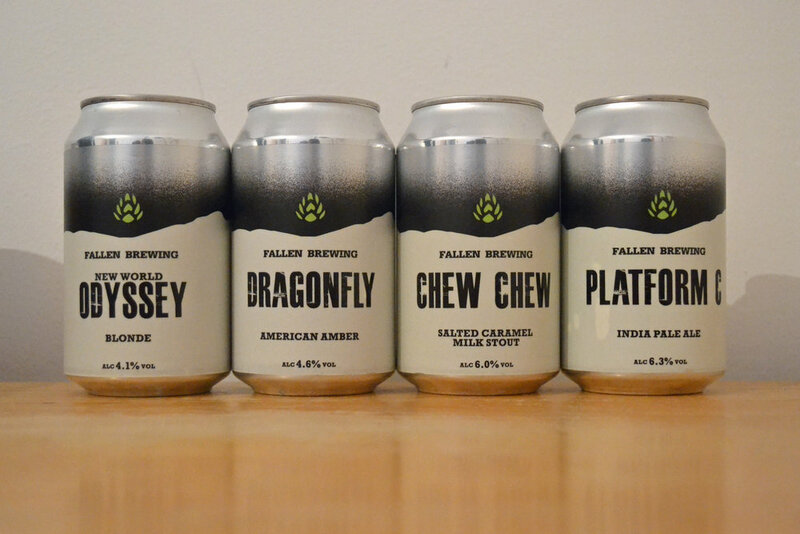 I’ve never normally gravitated towards amber ales as a style, preferring more hoppy red ales or lighter session pales, but was intrigued to see what Fallen’s version had to offer. The beer is a beautiful dark reddish colour with a slightly off-white head. The nose is almost entirely sweet toffee, with a slight floral tinge. It has a lot more body than the blonde, unsurprisingly given the more complex malt bill, which includes crystal malts, Melanoidin and flaked barley. It’s a very well balanced beer, with biscuit and caramel giving way to hints of pine, although I would have liked a touch more bitterness in the finish. Up first on evening number two was Platform C, the brewery’s 6.3 per cent New World IPA. I had high hopes for this one, after being impressed with a small sample at this year’s Craft Beer Rising festival. A deep gold/amber in colour and a punchy citrus nose has me quivering in anticipation of a real hop bomb, however I am left disappointed. The beer is incredibly bitter and resinous, and totally lacking in any juicy hop flavour. In fact, after a few more mouthfuls I suspect the beer may have suffered some oxidisation during the canning process. It tastes like blackcurrant mixed with wet cardboard, and that is most definitely not how this kind of a beer should taste. Admittedly, this can could have been anything up to four months old, and probably wasn’t quite at its best, but I’m fairly certain that the problem was more than just a lack of freshness. It’s a shame, because my memories of the beer from CBR were very positive. The final beer sent was Chew Chew, a 6 per cent salted caramel milk stout. Any of you who know me well will know I have a bit of a thing for sweet stouts (perhaps due to my intense dislike of Guinness). Hence, the prospect of a stout brewed with dark Belgian candi syrup and lactose had me very excited indeed. The beer pours an oily black, with medium carbonation and body. It’s thick, but not gloopy, viscous thick. It smells slightly peaty, but the predominant aroma is of cocoa. It is initially sweet and milky on the tongue, which gives way to a salty edge, provided by the addition of Hebridean sea salt, on the finish. As the beer warms in the glass, more chocolate and fudge comes through. It reminds me somewhat of Dark Star’s Crème Brûlée, with a salty undertone that doesn’t quite win me over, but gives it it’s best shot. With the exception of Platform C, I enjoyed all of the beers from Fallen Brewery. None are world-beaters, but they are solid and dependable incarnations of their respective styles, which if available consistently near me would be go-to beers for sure. I look forward to hopefully seeing some more of the brewery’s beers in cans in the future.